The Holocene—the era between the last great Ice Ages and the present—has been a comparatively stable climatic stage for humanity. But that comparatively is crucial: natural processes like volcanic eruptions, orbital cycles, and changes in solar output have lead to rapid changes in climate for various parts of the world. The Romans, Harper argues, were lucky enough to start building their empire at a time of remarkable plenty. The period between 200 BC and AD 150, known as the Roman Climate Optimum, saw a warm and wet climate settle over the temperamental Mediterranean. The resulting environment would have looked fairly different from the modern world. In the Egyptian coastal city of Alexandria, it rained every month of the year but August—today, Alexandria gets a combined day of rain from May to September. Naturalist Pliny the Elder noted that Beech trees were advancing from the lowlands into the mountains, and off-handedly recorded the presence of elephants and lions in the Atlas Mountains of North Africa. Glaciers in the Alps retreated to levels seldom seen before the 21st century; vines and olives were cultivated further north than ever before. The resulting Roman state was something Europe had never seen before, a thriving network of roads, seagoing trade routes, and cities that bound the Mediterranean and Near East into a cohesive whole. Reliable crop yields from Italy and North Africa fed a growing population. The Empire fielded organized armies recruited from across the known world, supplied by materials from Spain to Palestine. That cohesiveness began to crack in the 3rd century, when a mixture of cooling and drought broke the Roman Climate Optimum and ushered in a period of climatic uncertainty. Rains in Southern Egypt, Austria, and Greece were late, or failed to come at all; the glaciers began to creep back down from the mountains. The Plague of Cyprian—suggested by Harper to be a hemorrhagic virus akin to Ebola—ravaged the Roman world, provoking a decline in civic religion and providing an opening for what was at the time a marginal, apocalyptic movement: Christianity. The empire nearly came apart under endless civil war and financial meltdowns. A new lineage of frontier emperors eventually managed to restore the state to something like its former glory, but stresses remained under the surface. By the beginning of the 5th century, widespread drought on the Eurasian steppe set loose a massive wandering of peoples that overwhelmed the tired empire’s frontiers. Roman officials mismanaged the resulting refugee crisis so badly that they sparked a frontier revolution, resulting in the worst military loss in the empire’s history and the eventual sacking of Rome itself. The seeds for these troubles lay partially in Rome’s successes. Roman agricultural practices stripped forests and contributed to widespread erosion, while hunting and settlement practices wreaked ecological havoc. As Roman civilization spread across the continent, the general health of the population dropped: The skeletal remains of people under Roman rule—including the Romans themselves—are smaller than both their ancestors and medieval successors. The increased connectivity of the Roman world also opened the door to new forms of mass disease, emergent epidemics that filtered in from the imperial outskirts and laid waste to large swathes of the population. The worst of these was the first known eruption of Yersinia pestis, the bacterium that causes bubonic plague, in the 6th century, which managed to kill half of the continent’s population and stopped the Eastern empire’s renaissance in its tracks. Y. pestis arrived partially due to climate impacts on rodent populations. Harper’s focus is resolutely historical, dealing only glancingly with modern climate concerns. But the book’s theme is essentially a timeless one: how big, complex societies handle strain and shocks from factors outside of their control. That gives it some relevance to the challenges we face today. 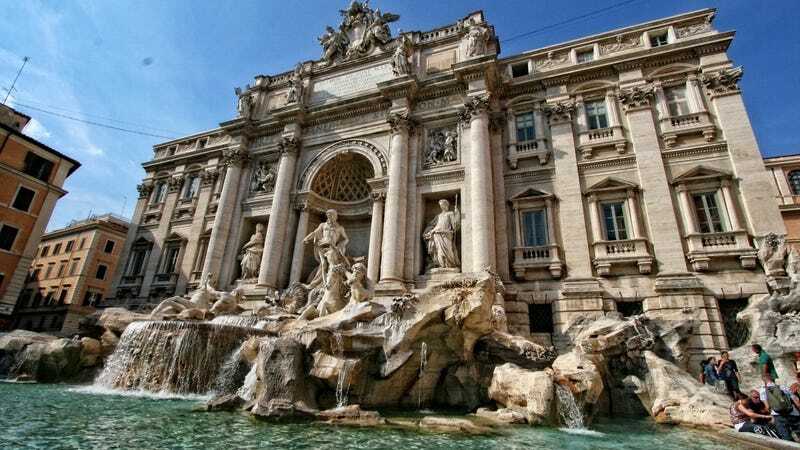 This summer, a particularly nasty drought struck southern Europe, reducing crop yields to their lowest point in 20 years and causing such drastic water shortages in Rome itself that water to public fountains and high rise buildings had to be cut off. Future projections suggest that the Mediterranean is likely to get quite a bit hotter and drier, which will place additional pressure on the people who live there. When it comes to attempting to mitigate the impacts of a changing world, Wyman said Rome offers an example of how quickly problems can stack on top of one another. A complex society is a society eternally at risk from shifting foundations, he said. If the Fate of Rome proves anything, it’s that nature always has the last laugh.